Walking into the dog store the other day threw my three year old off. In one section of the pet store stood an entire display of gourmet dog cookies. She thought we had walked into a bakery and sobbed when we had to leave. She was convinced we should not have left without getting a cookie for her to eat. These cookies were decked out! There were cookies tinted in a red and green dog frosting recipe, carob cookies and cookies that looked like the traditional Christmas tin butter cookies. It threw me for a loop too! We went home and started making our annual dog Christmas cookie list. This year we decided to up our game. Last year we made a yogurt based frosting, but this year we went with carob and peanut butter. 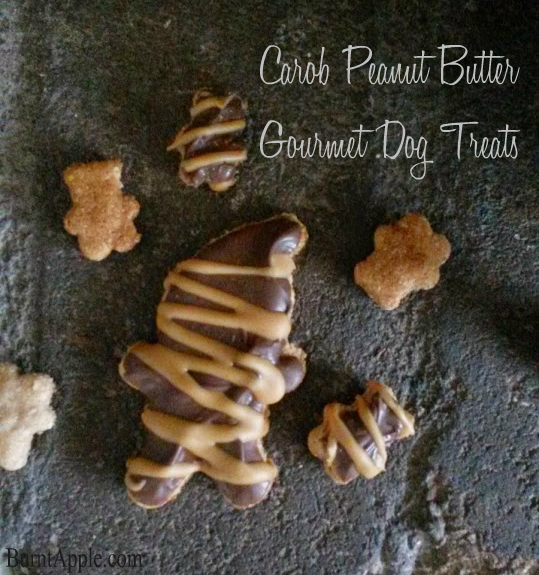 These gourmet dog cookies have a peanut butter base (a dog’s favorite) with oats that are great for added fiber and egg for a shiny coat. To make the cookies, we used our Hamilton Beach Stack n’ Snap 10 cup food processor. I love how easy it was to use–oh my goodness it tells me which blade to use and what button to press depending on what I’m making. And I don’t need an instruction booklet–it’s right on the food processor! My life has been made so easy now. I also like that you don’t have to twist and lock the food processor into place to get it to work. (A pain with my old food processor). You simply just stack your food processor and lid and it snaps right into place. No twisting required. You can also read our take on the Hamilton Beach Set n’ Forget Slow Cooker or head to the Hamilton Beach website to see what other innovative and exciting products they have to offer this holiday season to make holiday cooking easier! 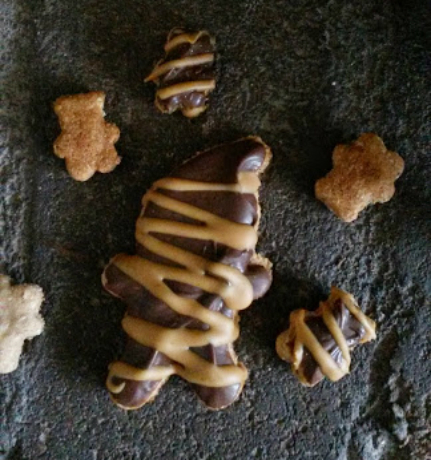 In the meantime, make these delicious carob peanut butter gourmet dog cookies recipe for your pampered dog this holiday season! In a food processor, mix together the whole wheat flour, oats, peanut butter, water and egg until a ball is formed. (You may need to add a little more flour or a little more water if necessary). Lightly flour your rolling surface. Roll dough out to 1/4 inch thickness. 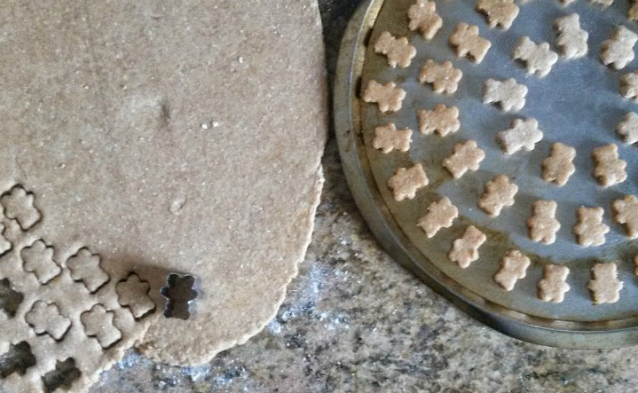 Cut with cookie cutters, then place cookies on lightly greased cookie sheet leaving 1/2 inch space between cookies. Bake at 375 degrees for 20-25 minutes or until cookies are browned and no longer soft to the touch in the center. Using the double broiler method (or the microwave melt chocolate 🙂 method) melt the carob. Dip the front side of the cookies in carob. Allow to set. (One of the great things about working with carob is that it hardens quickly. If your carob starts to harden, simply put it back in the microwave or on the double broiler again to melt). 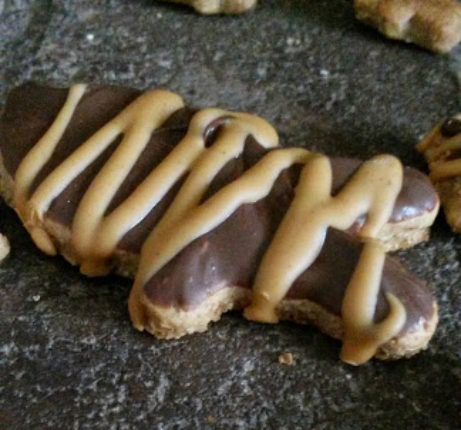 Melt a large spoonful of peanut butter in the microwave or on the stove until a glaze like consistency. Drizzle over the cookies and allow to set up. Disclaimer: We were given a Hamilton Beach Snack n’ Snap 10 cup food processor to try, our opinions of the product are our own.